Healthcare professionals can readily discern the acuity and severity of a patient's illness based on the presentation of the patient and objective data at their disposal. Although it is the responsibility of the clinician to convey the complexity of the case, it is not always easy for an auditor to infer that complexity while auditing an E&M encounter. One approach that can be used is referring to a diagnosis coding manual that contains notations for CC and MCC conditions. Not all publishers use these symbols in their coding manuals as they are representative of indicators for inpatient coding purposes. However, these particular codes may be found on the CMS website at https://www.cms.gov/icd10manual/fullcode_cms/P0370.html. The symbol 'CC' designates a complication or co-morbidity while 'MCC' represents a major complication or co- morbidity. When one of these codes is documented, one can infer that it is a severe to majorly severe condition and aptly apply it to the presenting problem on the table of risk. An additional approach is to identify what types of management options are considered for a given disease. Consulting a reputable clinical reference can provide valuable insight. These management options can be compared to the table of risk under management options. However, they are only given credit if actually ordered or performed. It becomes a useful tool when combing a record for data. Below are two examples, that when documented properly and using the approach outlined within this tip, will help capture and credit for patient complexity. In this scenario, even if the patient did not have emergent surgery for perforation or hemorrhage, but did have a colonoscopy, one can infer the overall risk is high in a patient with a perforated and/or bleeding diverticulitis. 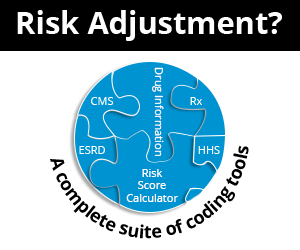 While the table of risk provides a few examples of presenting problems and management options that are considered moderate and high risk, why not consult your coding manual and clinical references to help identify patient complexity?